Smoke Testing comes into the picture at the time of receiving build software from the development team. The purpose of smoke testing is to determine whether the build software is testable or not. It is done at the time of "building software." This process is also known as "Day 0". It is a time-saving process. It reduces testing time because testing is done only when the key features of the application are not working or if the key bugs are not fixed. The focus of Smoke Testing is on the workflow of the core and primary functions of the application. Smoke testing does not require to design test cases. There's need only to pick the required test cases from already designed test cases. As mentioned above, Smoke Testing focuses on the workflow of core applications so; we choose test case suits that covers the major functionality of the application. The number of test cases should be minimized as much as possible and time of execution must not be more than half an hour. 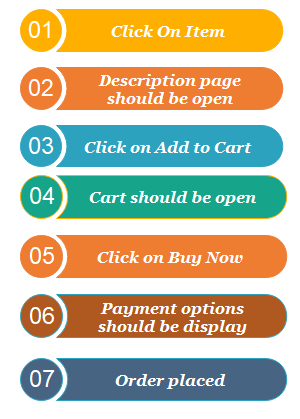 Suppose, we are using an eCommerce site, and the core working of this site should be login, specific search, add an item into the cart, add an item into the favorite, payment options, etc. Here we are testing function to place an order. After testing, the tester has to be sure and confident about the functioning of the function of the application. Description page should be open. Payment options should be displayed. Choose one of them. If this function is working correctly, then tester will pass it in testing and test the next function of the same application.